Posted October 15th, 2017 by Mike Boyes & filed under Anxiety OC PTSD, Assessment: Intellectual Cognitive Measures, Child Development, Clinical Neuropsychology, Consciousness, General Psychology, Intervention: Adults-Couples, Intervention: Children Adolescents, Neuroscience, Psychological Disorders, Schizophrenia, Treatment of Psychological Disorders. Description: Executive function or the process by which parts of your brain essentially tell other parts of your brain what to do, is a topic of intense interest as executive functioning, or [problems in executive functioning, may be related to a very broad range of issues from ADHD, to anxiety to OCD to name a few. 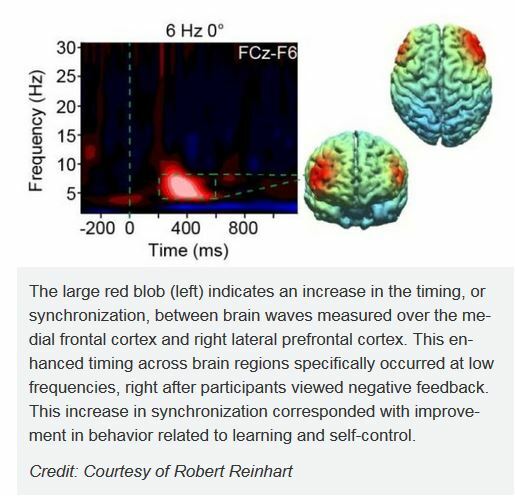 The article linked below describes research by Robert Reinhart that looks at the synchronization of two brain regions, the medial frontal cortex and the right lateral prefrontal cortex. If these functioning of these two brain regions are synchronized we show more executive function (think smarter) and when they are de-synchronized we act with less executive function or dumber. While interesting observationally, Reinhart has developed a way of directly affecting the level of synchronization in an immediate and targeted fashion using a form of electronic stimulation called high-definition transcranial alternating current stimulation (HD-tACS). When synchronized people show more executive function and more self-control and make better decisions. The quick and short-lived nature of these effects have some interesting implications for treatment possibilities for disorders like autism, ADHD and anxiety. Give the article a read and then think about what would need to be done to even start to examine possible treatment applications of this technique. Source: Turbo charge for your brain? ScienceDaily. The ability and apparent benefit to being able to “turn on” or stimulate executive function without having to use the messy tools that are drugs could well be a valuable management or even treatment tool. The key with suggestive finding like this (as the researcher who wrote the linked article suggests) is to further investigate what works, understand why it works and then to begin to carefully investigate treatment possibilities. More research IS needed but the opposites are quite exciting, given the central role of executive function in so many processes and disorders. What disorders and conditions might this technique and the functioning of these brain areas be related to? What do you see as the next steps necessary to looking further into the treatment possibilities of this technique?